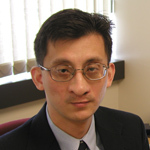 Dr. Tang’s principal teaching and research interests are in the general area of dynamics and control. He received the B.S. and M.S. degrees in Applied Mechanics from Fudan University, China, in 1989 and 1992, respectively, and the Ph.D. degree in Mechanical Engineering from the Pennsylvania State University in 2001. He was a lecturer in Department of Applied Mechanics, Fudan University, from 1992 to 1995. Prior to joining UConn in 2002, he worked in GE Research Center as a research engineer. Dr. Tang has studied a series of research subjects including smart structures, motion and vibration controls, signal processing, structural health monitoring, computational structural dynamics, uncertainty propagation, design optimization, and modeling and analysis of multi-physics systems. Dr. Tang’s research has been supported extensively by federal agencies and industrial companies.